And while a few wailed about Invasion Day… | The mind is an unexplored country. Others got on with the job of helping their fellow Australians. 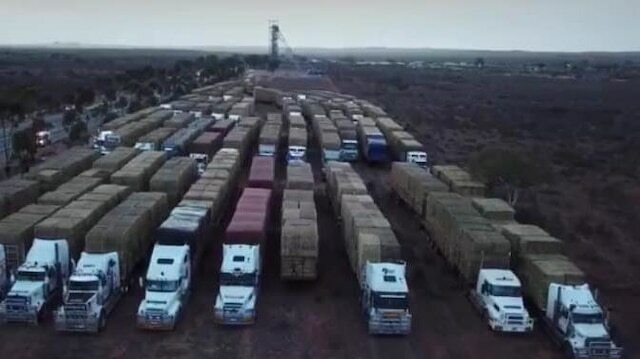 The major effort involved a convoy of 47 road trains carrying a whopping 3,500 tonnes of feed donated by WA farmers for their drought-affected Eastern States counterparts. The hay was delivered by 70 volunteers who left Norseman on Tuesday, which for some will involve a 10,000km return journey. …Cobar farmer Chris Lehman, said farmers in his area had been doing it tough, with many forced to destock. “It is a really good show of Australian spirit, especially on Australia Day,” he said. Flag courtesy of Crossed Pins.